BHS Football Coach Matthew Bentivegna Named to the 2015 “Great American Rivalry” Hall of Fame!!! 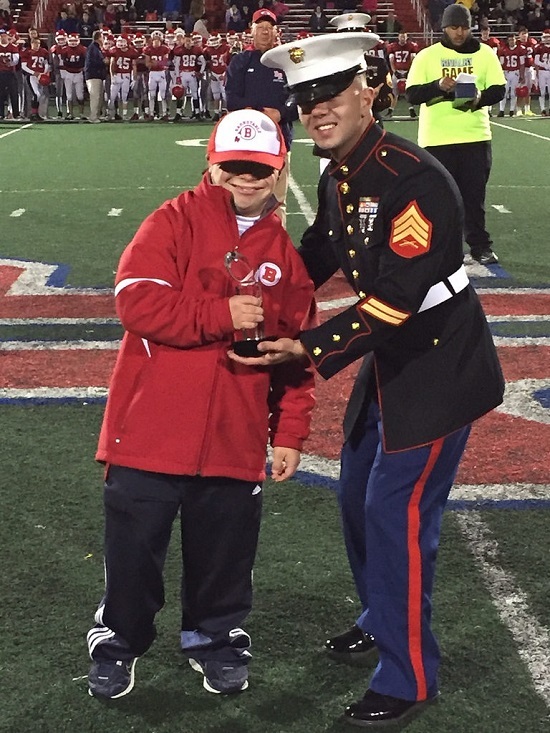 Here Coach Bentivegna is receiving his Great American Rivalry 2015 Hall of Fame trophy from the United States Marines. Barnstable High School football and lacrosse coach Matthew Bentivegna was honored during halftime at last Friday night’s football match-up between the Red Raiders and the Bridgwater-Raynham Trojans. Inducted into the 2015 United States Marines “Great American Rivalry” Hall of Fame, Coach Bentivegna was recognized for his longstanding and highly valued contributions to the Barnstable High School football program. Coach Bentivegna began his participation in the BHS Red Raider football program as a sophomore in 2007, named Team Manager. In 2009, he became the first Barnstable High School student voted by his peers unanimously to be Captain of the football team. Well known and highly respected for his knowledge of the game, perseverance, team leadership skills and undying Red Raider spirit, upon graduation from high school, the prior popular Team Manager was appointed to the football team coaching staff. Congratulations Coach Bentivegna on this richly deserved honor! !